With water temperatures holding in the low 40’s my days are numbered on the jumping pictures. But here is one from late last week. With a fresh push of chrome hitting a rising river, hope to get a couple more chances at my elusive perfect pic. So far for 2013 this is my favorite. The rain had finally stopped, I had the camera set up with the proper ISO, rapid fire was engaged, and my 70-200 with IS was ready. But this steelhead just would not leave the comforts of the river. As water temps have dropped into the 40’s now (48 yesterday). My season of capturing the ultimate jump shot is shrinking. Oh well. On a positive note last weeks swing game was great. This week I’m looking forward to the challenge of high water. Yesterday with water levels going from 1700 to 2500 cfs we still found a handful of players. Once water levels maintain for a few days and I dial in the color combo’s, I expect a good week on the streamer game again. 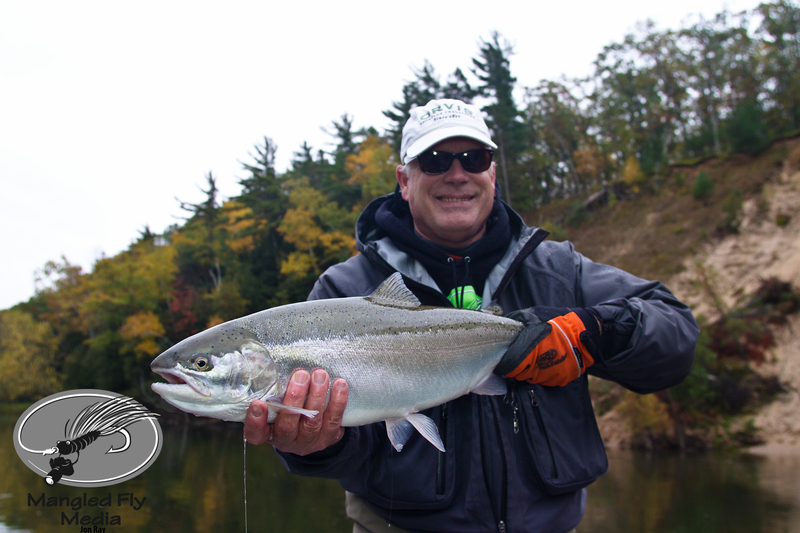 The contrast of the bright orange pants with the green tree line, and the pure beauty of a Michigan fall run steelhead. I love taking pictures of these fish. Have some exciting things in the works with Snap T Pictures again. As Erik Rambo and I contiunue to combine forces on projects. We have been bouncing around in the dark, and are excited about the latest project that should be done this fall after all the editing. Stay tuned to see what night vision camera’s saw in the dark. Here is a little lesson for you to learn. You know those patterns that you fished last year that you put back in your box. Make sure to check the hook closely. As this trout taught us, after we hooked him, he made quick work of us and lost him, because the hook did not make it. 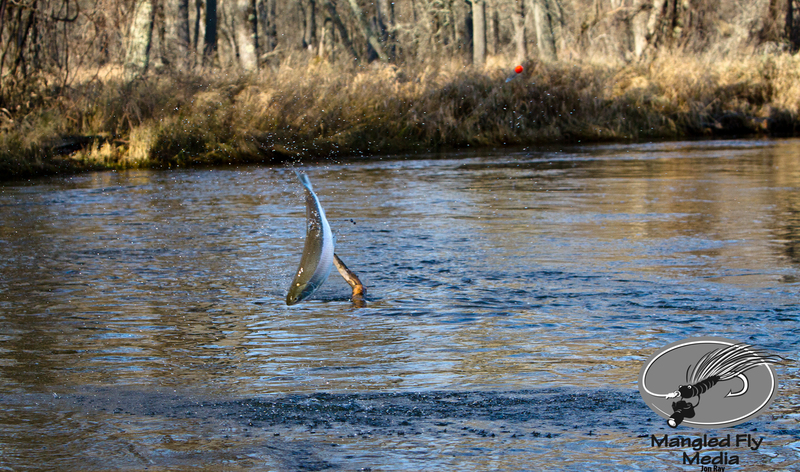 This guide standby pattern had rusted out through the winter and was too weak to land a nice trout eating sulphurs. With the official start of lamprey season (chestnut lamprey), the biggest match the hatch we have here in Michigan for our streamer program. Not that there is really a season for lamprey, but I just happened to notice they the crawled out of the mud this week. Some people have told me trout don’t eat lamprey. Okay. If they don’t eat them, I’m fine with that, but they sure don’t like them. Pictured below is a trout we caught this weekend on an imitation lamprey streamer pattern. This trout had 11 different lamprey attached to him and out of anger destroyed my simple fur and feather pattern.